The dialog boxes that appear in the client applications such as Smart Connection and Content Station contain a default set of metadata properties. 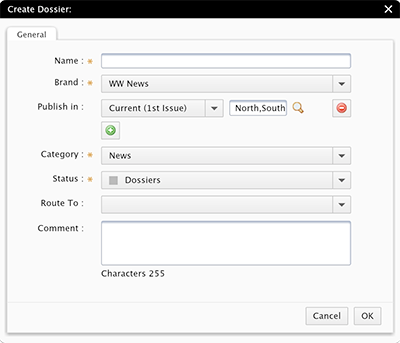 Figure: The Create Dossier dialog box in Content Station, showing the default set of properties such as those for saving the Dossier to a Brand, assigning it to a Category, adding a Status, and more. Many more metadata properties are available in Enterprise Server and when needed, custom properties can be added to Enterprise as well. The dialog boxes can be customized by adding or removing properties, depending on which ones are needed in a particular workflow. This article describes how to do this. The steps in this article apply to any version of Enterprise Server 10.5, or any other higher version of Enterprise Server. 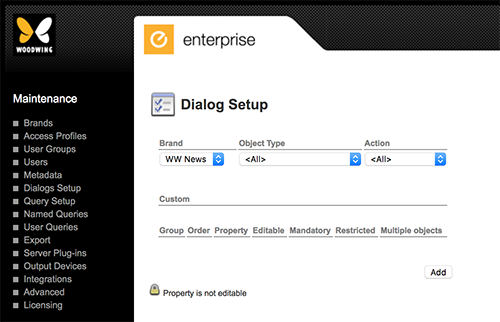 For earlier versions, see Adding a property to a dialog box in Enterprise 10.0 – 10.4. Client applications such as Content Station and Smart Connection can add their own required properties or hide properties that are not supported by that client. The actual properties that are shown to the end user might therefore be different than those that are configured here. Step 1. In Enterprise Server, access the Dialogs Setup Maintenance page. 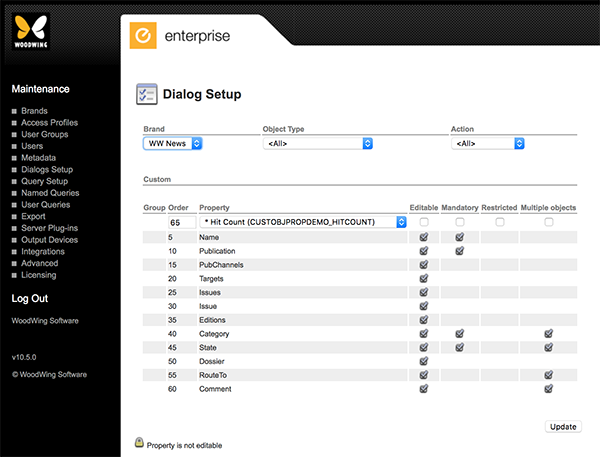 Choose Dialogs Setup in the Maintenance menu on the left side of the screen or on the Home page. Step 2. Use the filter at the top of the page to specify to which Brand, for which object type and for which action the properties should be made available. Example: To make the properties available to the Check In dialog box of images for all Brands, choose Brand '<All>', Object Type 'Image' and action 'Check In'. Preview Properties (not editable)2 Not applicable. 1 Only a limited number of properties can be added to the Send To dialog; these include dynamic properties and XMP properties but no static properties or custom properties. 2 This action is used in Content Station 9 to show the property when previewing a file. Step 3. At the bottom of the page, click Add. When adding a first setup for the chosen Brand / Object type / Action combination, a message appears stating that in the setup that you are about to create, mandatory properties such as Name, Publication and Status will be automatically added. You will also be asked if regularly properties such as 'RouteTo' and 'Comment' also need to be added. Step 4. Click Yes or No. Note: Properties that are added by clicking Yes or that are left out by clicking No can at any time be removed or added in the next steps. A list of properties appears: all mandatory properties and optionally all regularly used properties. The option at the top of the list can be used for adding additional properties. Note: Options for managing the already added properties will become available as soon as a change is made on the page: either by adding a new property or by navigating to a different setup and then returning to this setup. Step 5. Add additional properties by choosing a property from the top of the list, setting its options, and clicking Update. For more information, see 'Property options' and 'Restricted properties' below. Note: Review the settings that are shown for that action; they may hold additional information. Example: When adding the Character Count property, the editable setting is automatically selected and a lock icon ( ) is displayed to indicate that this option cannot be edited (this is because the character count value is provided by the system and should not be entered manually). The setup is added to the list of Custom setups. Clicking it will display the properties for that setup. The following list shows the options that can be set for each property. Group. Not editable on this page. Shows the name of the Group as set on the Metadata Maintenance page for the property. This allows you to group together properties. Order. (Optional) Enter a number that specifies the order in which the property should appear in the dialog box. The higher the number, the lower the property will appear. (For Enterprise Server 10.5.2 – 10.5.x or any higher version of Enterprise Server) An order number can only be assigned to dynamic properties and custom properties. The assigned value should also be higher than the highest value of the static properties. Property. Shows all static, dynamic and custom properties that are not yet added to the dialog box. Note: Custom properties are listed first and are preceded by an asterisk character (*). When selected, the user will be able to edit the content of the property, for instance by editing the default value or by entering a new value. When not selected, the property appears unavailable (grayed out) and will not be editable by the user. This can be used for instance when a default value is given for a property that should not be changed, such as copyright information. When selected, the user is required to enter a value for that property. If no value is entered and the user attempts to go to the next step of the process (for instance by clicking OK button), a message appears informing that a value is required for that property. When not selected, the property can be left blank by the user. When selected, only users that have the option 'Change Restricted Properties' selected in their Access Profile are allowed to edit the property. For all other users, the property appears unavailable (grayed out). When not selected, the setting of the 'Change Restricted Properties' option in the user's Access Profile is not taken into account. Multiple Objects. (For Content Station 9 and only when 'Send To' or 'Set Properties' has been selected from the Action list) Select if the property should be available when a Content Station user wants to change the properties for multiple objects or files. Not all combinations of Editable, Mandatory and Restricted can be used together. Example: Making a property Mandatory but not Editable is not logical if no default value is provided. The table below shows an overview of the combinations that can be used. 1 Selected Selected Selected Logical, but only if a Default is set. Users without ‘Restricted’ rights will not be able to edit the mandatory property. 2 Selected Selected Not selected Correct. It is logical to make an item editable when also making it mandatory. 3 Selected Not selected Selected Correct. By setting Restricted, all users who do not have the option Change Restricted Properties set in their Access Profile will not be able to edit the item, even when Editable is selected. 4 Selected Not selected Not selected Correct. Typically a common, optional property. 5 Not selected Selected Selected Not logical. The property will not be editable, not even for users with restricted rights. Use #1 instead. 6 Not selected Selected Not selected Rare. Only makes sense if a Default is set. Users will not be able to edit the default. 7 Not selected Not selected Selected Not logical. The property will not be editable, not even for users with restricted rights. Use #3 or #8 instead. 8 Not selected Not selected Not selected Correct. Typically used for read-only properties. 12 April 2019: Updated section 'Property options' by adding information about Enterprise Server 10.5.2 to the notes for the 'Order' option.